Some of the Personalized Anniversary Gifts are available in various sizes and shapes and colors. Once you are on the Zazzle product page, scroll down on your right to see various options. Little Linda Pinda Designs can change the COLORS, YEAR and Design, at no extra cost. I offer a Free custom design service on Zazzle products. As an independent Zazzle designer, I can make these changes or place any parts of any of my designs on any of the personalizable gifts. I can change Personalized Sixtieth Wedding Anniversary Gifts to any language as long as you provide me with the exact spelling. Diamond Wedding Anniversary Gift Ideas are memorable, practical and beautiful. Diamonds are the symbol for 60th Wedding Anniversaries. You can choose 60th anniversary gifts that don’t need any customization too. You can type in your special message or delete the temporary text instead. Absolutely gorgeous 60th Wedding Anniversary Presents will be a memory the anniversary couple will cherish forever. Call Linda to make Custom Changes for You. Any Year, Any Color and many Gemstones for different year anniversary gifts, birthday etc. Diamond Wedding Anniversary Gifts for Parents, Grandparents and Friends and 60th Anniversary gifts for couples who have everything. 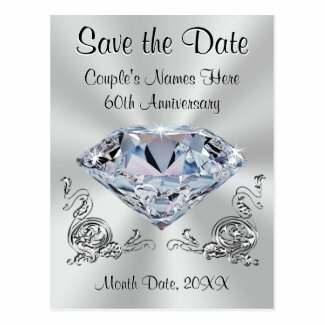 I can place this diamond anniversary design on any of the many personalized 60th anniversary invitations and gift ideas. to see Thousands of Personalized Gifts for Weddings, Any Year Anniversary Gifts, Sports Stuff, Photo and Personalizable Gifts by Little Linda Pinda Designs. In conclusion, giving personalized 60th anniversary gifts for grandparents, parents and special family members will be a highlight of their big day. Please feel free to give me, Little Linda Pinda a call for beautiful personalizable gifts for many occasions. In addition to our custom service on every part of every one of my designs is customizable, I also can assist you in ordering online at Zazzle. Also, If you are looking for a different Language, different Anniversary Year or Birthday, I offer free customization on all our products. [email protected] Calling or Texting is BEST and fastest. If you do contact me via email, please ADD “CONTACT LINDA” in all caps in the Subject line. Thank you for visiting our Diamond Wedding Anniversary Gifts for Parents and other family and very special friends. Feel free to call me, Little Linda PindaPinda, to create personalized 60th anniversary gifts or for any year in any color or for special anniversary symbols. 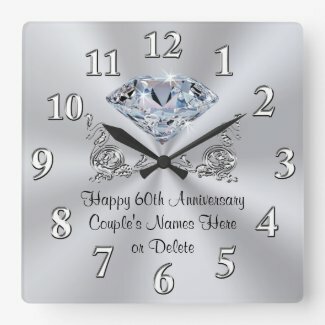 Feel free to call Designer Linda to create gorgeous or rustic personalised diamond wedding anniversary gifts for parents, grandparents, wife and for anniversary couple’s who have everything. 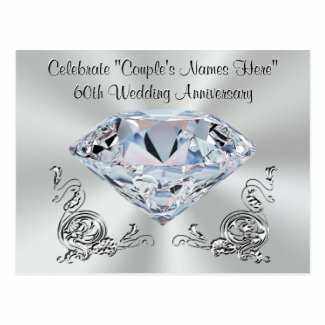 I can place the stunning diamond wedding anniversary decorations on any of Zazzle’s hundreds of customizable anniversary party supplies, sixtieth wedding anniversary gifts and more. Your paperware will become part of the 60th anniversary decorations because they are so beautiful and unique.